The third vision of the Apocalypse takes place in the wilderness, where Jesus unveils Babylon, the harlot city that drinks the blood of the saints. This is the thing that will shortly take place: The beast that carries Babylon is going to turn on her and destroy her. This third vision takes us from the fall of the harlot city all the way through to the end of this phase of history, from the fall of Jerusalem-Babylon through to the end of the world. Three enemies of the saints have been introduced in the second half of Revelation, one by one. First there is the dragon, Satan; then there is the sea beast and the land beast, Rome and the leaders of Judaism; finally the harlot city, Jerusalem, is unveiled to John. Over chapters 17-21, these enemies are exposed and defeated, in the reverse order to their introduction – first the harlot (chs. 17-18), then the beasts (ch. 19), then the dragon (ch. 20). There’s a final judgment and the Bride, new Jerusalem, descends from heaven to join heaven to earth. That seems like a neat conclusion. Everything is over. The harlot, the beasts, the dragon are all defeated, all tormented in the lake of fire. The saints are in the heavenly city. Everyone’s eternal destiny has been decided. But all that takes place in the third of John’s visions. Time to roll the credits. But the Spirit isn’t finished unveiling things to John. There’s another vision to come. The Spirit sweeps John from the wilderness up to a mountain. And he sees a vision of new Jerusalem, the city that has already descended from heaven. It’s descending from heaven again, only this time John sees and describes the city in more detail. What gives? Why do we see the city descend twice? Are there two cities of God? It’s the same city. But it’s the same city at two different phases of its history. 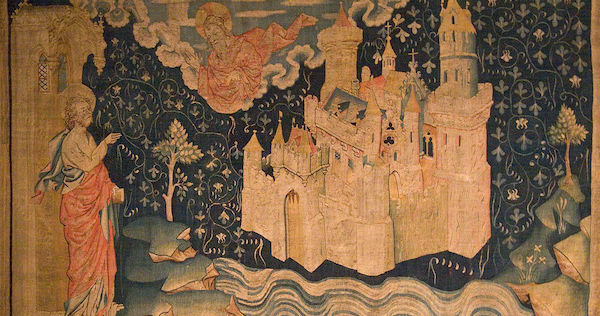 The first vision shows the city as it descends from heaven after the final judgment. It’s the final dwelling of the saints. It’s the new heavens and new earth. This is the city that we still await, the city that we still look for, whose builder and maker is God. The heavenly city of the final vision is the same city, but at a different, earlier moment of her history. Here there are nations outside the city, bringing in their treasure. Here there have to be guards at the gates of the city, to prevent anything unclean from entering. Here the city shines with light to the wider world, who begin to walk by its light. We look for a better city. But we have also already come to Mount Zion, to the assembly of angels and saints, to the joyful assembly (Hebrews 12). The city is our future; but the city is also our present. The final city is the church triumphant, the eschatological church. The second vision of the city shows us the eschatological city in time, the city that is the church, the city of which we are already citizens. The city is a cube, or perhaps a pyramid, where all the dimensions are equal. The Most Holy Place of the tabernacle and temple was a cube, the same height and length and width. New Jerusalem, the city we now inhabit, is a sanctuary expanded to become a city, a sanctuary city. It is, in its entirety, a place of worship, where the saints carry on the liturgy of the Lord’s day and the liturgy of daily life. This city needs no sun or moon. It’s illumined by the Lamb. It is never in the darkness because the Lord and the Lamb dwell there. And that light from the Lord and the Lamb is reflected out to the nations, so that the nations can walk by that light. It’s a city of purity. It has gates for the nations to enter to bring their treasures. But those gates are guarded, so that nothing unclean enters the city. It’s not only a temple and a city but a garden. Like Eden, it contains the tree of life, with fruit and with leaves for the healing of the nations. Like Eden, a river flows through it, and out of it. Like Eden, it’s the place of the Lord’s presence. The final vision is of Eden restored, and glorified, Eden built up into a city. We might say, the church doesn’t look anything like this. The walls of the church seem porous, without guardians. The city doesn’t seem to produce much light. The city doesn’t make the world fruitful. It doesn’t heal nations, but too often intensifies conflicts among nations. That misses the point of the vision. Moses ascended the mountain to see the pattern of the tabernacle, which was to be replicated at the foot of Sinai. The Lord gave David the pattern for the temple, which he passed on to Solomon to build the temple. While in exile, Ezekiel saw a vision of a new temple, which he passed on to Israel as a blueprint. John is a new Moses, a new David, a new Ezekiel. He has ascended a mountain. He has seen the vision of the city that is coming and is now, and he brings it to earth so that we can begin to build after the pattern that John saw on the mountain. We need to repent so that our good works shine with the light of the Lamb. We need to find guardians to keep the church free of infection. We need to get in step with the liturgy of heaven, so that our worship and life make the church a sanctuary city. We are called to be peacemakers. The church needs to receive life from the Spirit so that she can become a source of life. We’ve come to the end of Revelation, the end of the Bible. But it’s not so much an ending as another new beginning. And the final vision isn’t a vision of the end. It’s a vision of the present, of the city that we already inhabit. This is the city that is the Christian church. The church is this sanctuary-city, this new Eden, this temple.